Ronda is the most famous of the pueblos blancos. It was built atop a deep ravine and is said to be where bullfighting was invented. There are a number of excellent organized tours which take you to this out-of-the-way town. 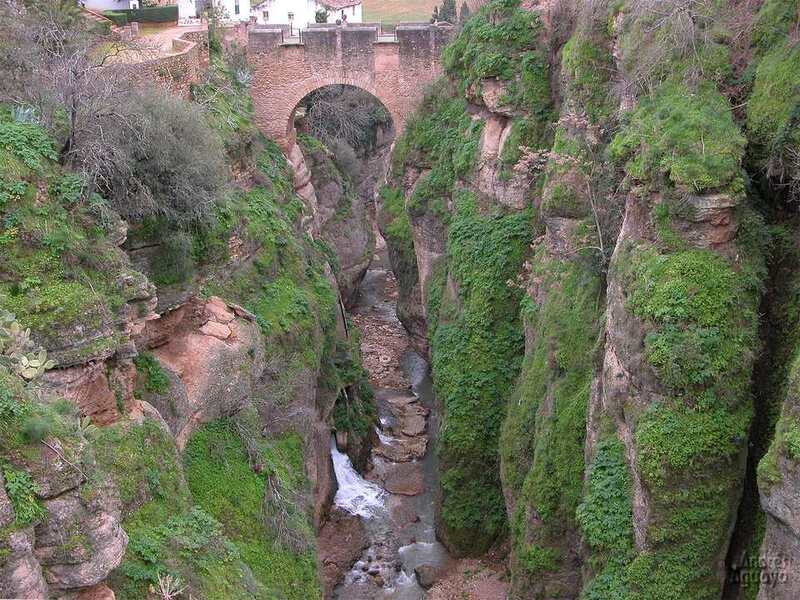 Ronda is typically done as a day trip, but many fall in love with the place and want to stay longer. If you plan on visiting the Cueva de Pileta (see below), you'll need more than a day. In September, there is the Feria de Pedro Romero as well as a big bullfighting festival, the Corridas Goyescas. After you visit Ronda, you can head East to Granada (via Malaga) , south to the Costa del Sol, or south-west to Tarifa or Cadiz. Cross the deep ravine, El Tajo, on one of the three bridges - the Puente Nuevo (new bridge) is the grandest one. Explore the Islamic old town. Due to its location, Ronda was one of the last towns to fall to the Christians during the Reconquista. Visit the bullring, where the Romero family (three generations of it) established modern bullfighting. A half-hour's drive from Ronda is the Cueva de Pileta a cave with 25,000-year-old paintings. The beautiful 14th-century baths are also worth a visit. Ronda isn't easy to get to and is at least an hour from most cities in the region, requiring a frankly scary drive along some very windy mountain roads. At least it was scary if you'd been in the car I was in! The train station and bus station are in the northern part of the city, (as well as much of the town's amenities), the old Islamic quarter is to the south - between the two is a deep ravine. Thankfully, there is a series of impressive bridges joining the two. If you're in Ronda for more than a few hours, you will probably spend more of your time in the northern half than in the south (and you'll almost certainly sleep there). Plaza España and the nearby Plaza de Toros will be your point orientation spot. From here you can cross the bridge at the Puente Nuevo, the most important of the three bridges. On the other side is 'La Ciudad' (The City), which is the old Arabic quarter. Upon crossing the bridge, turn left - there you will see the Casa del Rey Moro. Its gardens are open to the public, as is the Islamic stairway cut into the side of the gorge. The other two bridges can be located here to take you back across to the northern part of the city. But before you do that, explore the rest of La Ciudad. On the other side is Plaza María Auxiliadora, offering excellent views of the Andalusian landscape.